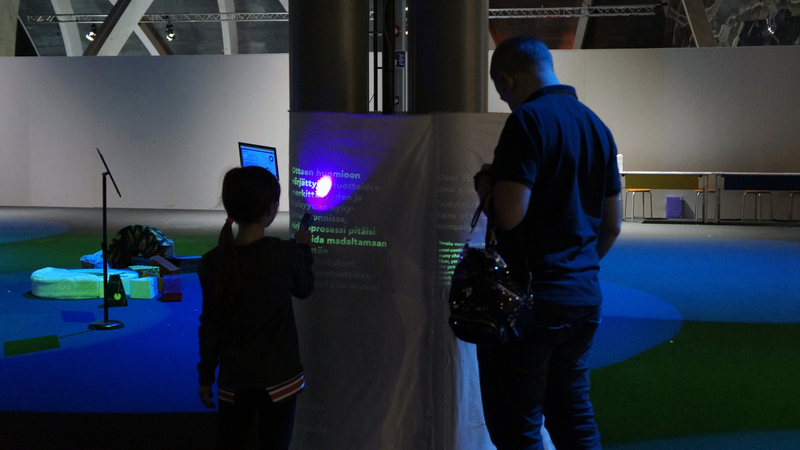 To engage the public in synthetic biology, we aimed to guide people to learn while playing.  We collaborated with Heureka, a science park in Finland. Our project, SILKOLOR, was the main theme, combined with different synthetic biology related activities to invite the public to know more about synthetic biology. The activities are shown below. Textile production, and specifically textile dyeing, is one of the biggest water polluters in the world. However, people may not notice that the textile or clothes that they are wearing right now might be a big threat to clean water. 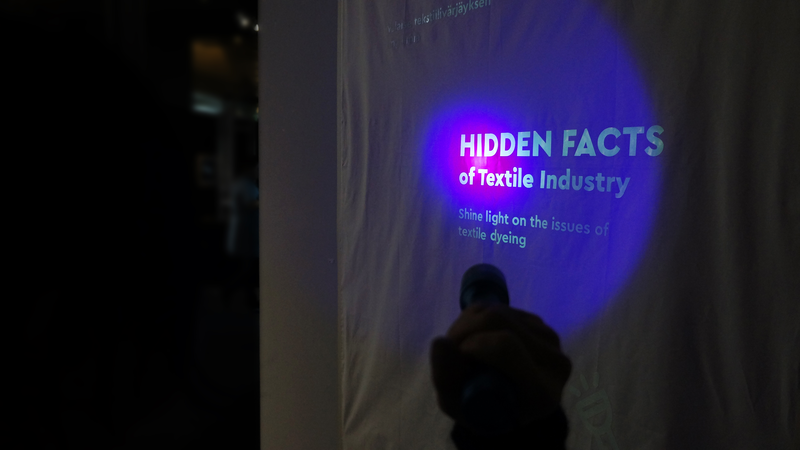 In order to help the general public to understand how the textile industry influences our daily lives, we brought the hidden facts of the textile industry to light. The facts can be illuminated by shining a UV flashlight on them. Visitors looking at the hidden facts. 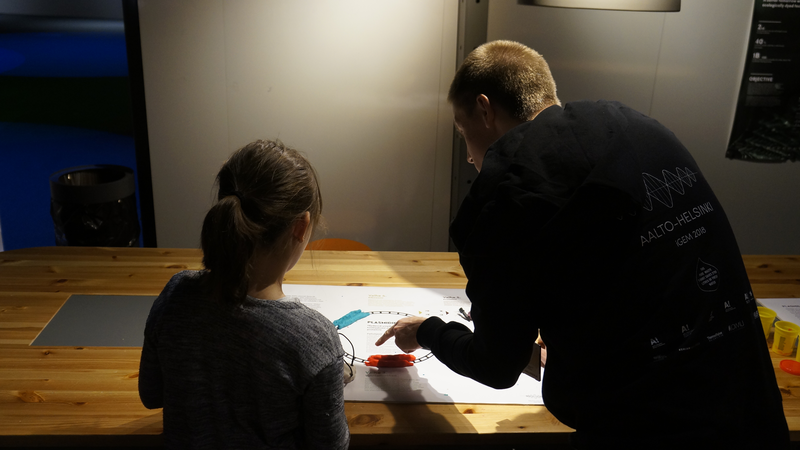 The plasmid puzzle was one of the four activities that our team developed for the Heureka weekend event. 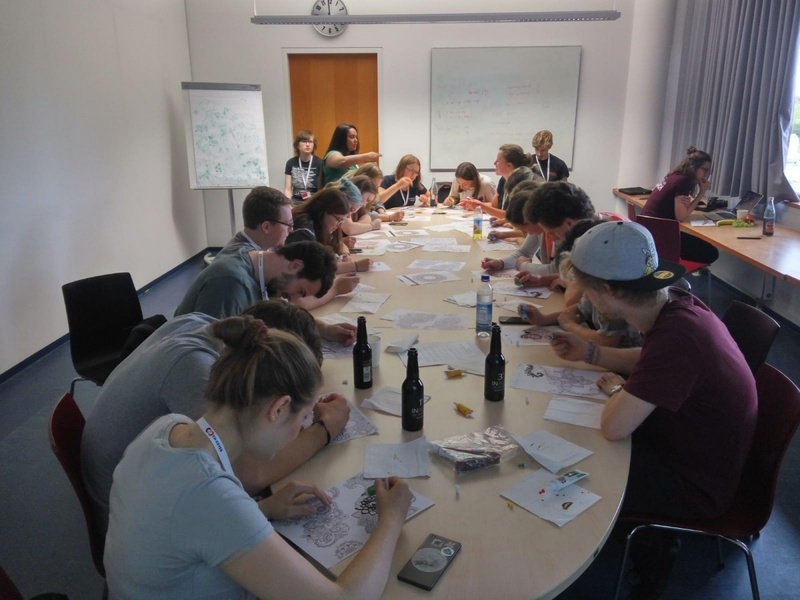 The primary purpose of the activity was to educate people about plasmids and how they can be utilized in synthetic biology to help produce desired proteins. To accomplish that, we wanted to involve the visitors in an engaging and interactive way to sort of create their own plasmid in order to successfully express a protein. The plasmid puzzle game in its completed form. The underlying idea of the plasmid puzzle was to portray a plasmid with the help of an electric circuit. Through several cycles of ideation, prototyping, and testing in an iterative fashion, we made a final product that used conductive dough to represent the phosphate backbone strands of DNA, while LEDs with their positive and negative legs (anode and cathode) between two dough strands represented base pairs of DNA. Additionally, electric cables with magnetic ends were used to represent a ribosome, and a motor covered with dough was used to represent a protein. The target audience was a bit older children (10+ years and older), as the game consisted of multiple steps and contained small parts. Both English and Finnish versions of the game were prepared for the audience. 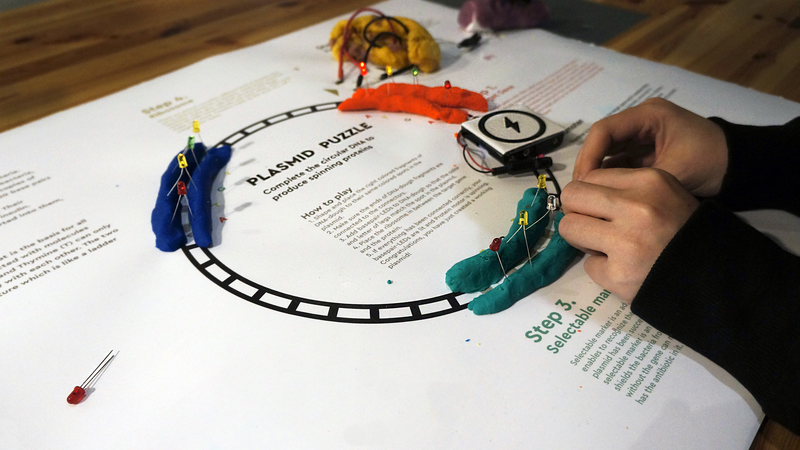 The first step of the game is to mold and place the right colored conductive dough in their respective places in the plasmid template, which were the origin of replication, target gene, and selective marker. The second step is to fill the color-coded LEDs to their right position according to what base pair is being asked for in the template. The final step is to plant the ribosome between the target gene and protein to make the protein spin. Guiding a visitor through the steps of the plasmid game. 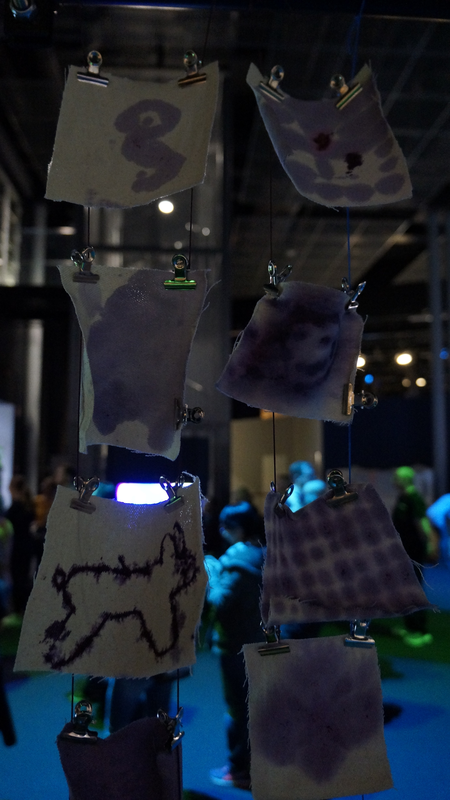 Overall, both children and adults seemed to enjoy the plasmid puzzle, as playing with conductive dough and LEDs allowed the visitors to immerse themselves while trying to understand the purpose and functionality of plasmids. Also, the surrounding descriptions and information around the game template gave the adults and teenagers an opportunity to have a deeper learning experience about what the plasmid and its parts are and why they are important. 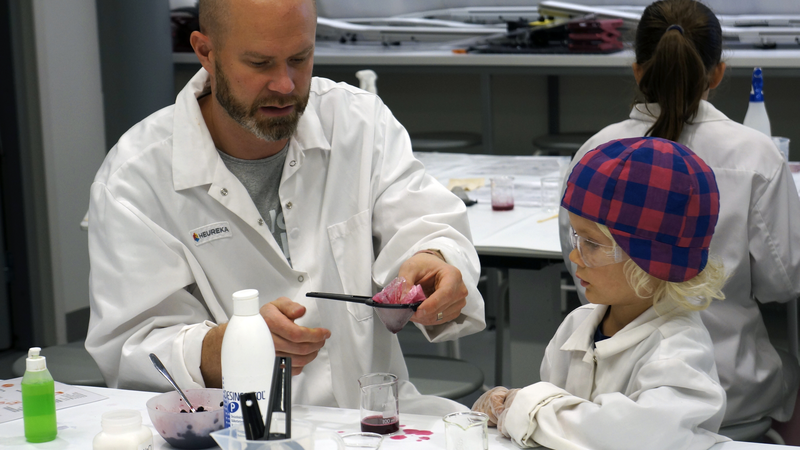 In one of our workshops, visitors could extract DNA from blueberries and lingonberries using safe household chemicals. We also taught children about what DNA is and what it does. 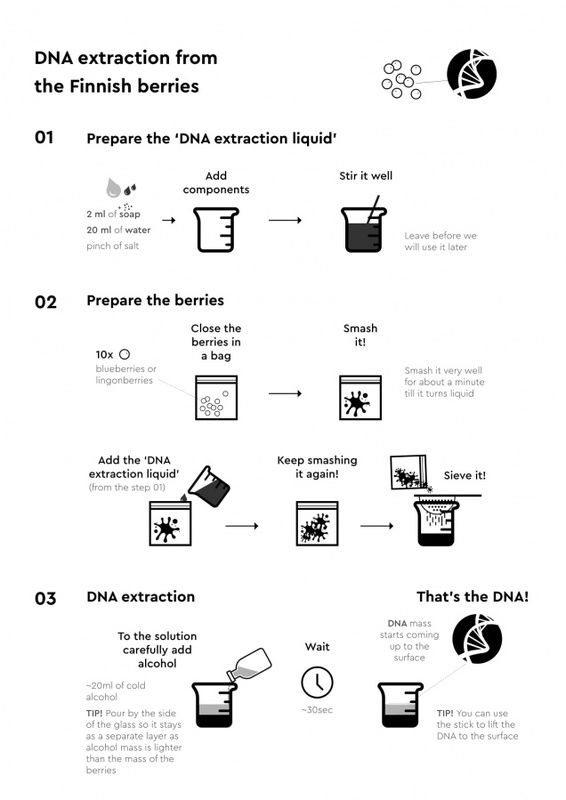 The instructions for DNA extraction. After completing the DNA extraction workshop, visitors could use the resulting DNA juice to dye pieces of cotton fabric. The pieces that weren't taken home by visitors were used to create an art installation. 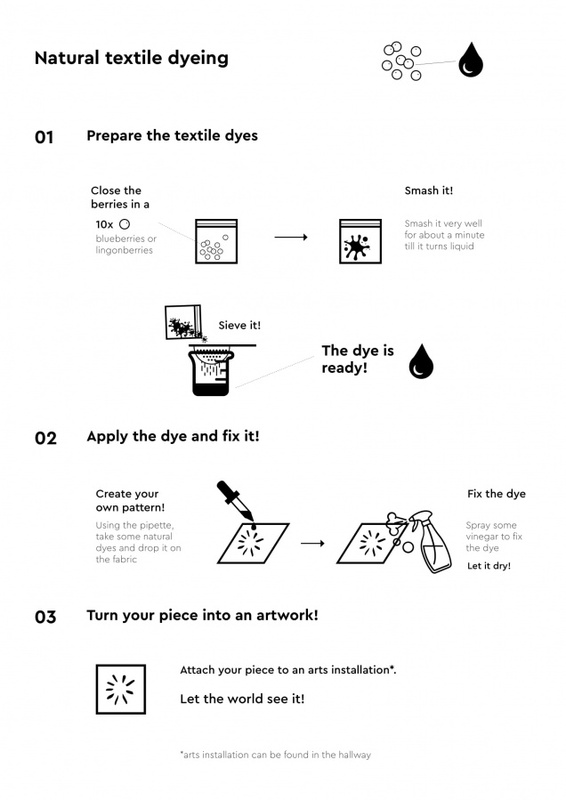 The instructions for dyeing with berries. A part of the art installation created with dyed fabric. We surveyed the participating kids and adults separately to find wide spectrum of information. We were interested to find out how children felt about our activities and which activity was their favorite. For the ease of data collection, we used an online platform to display the participant satisfaction questionnaires. Since the survey was limited to our exhibition in Heureka only, we used non-probability convenience sampling to ensure ease of access. Among all the participants of the survey questionnaire, 77.8% showed interest in recommending our exhibition workshops to their friends, while 22.2% answered that they might. 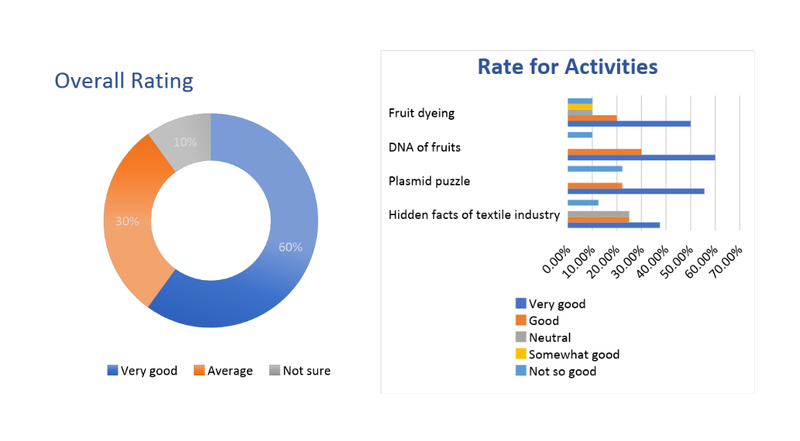 It was interesting to see that the majority of the participants enjoyed the DNA extraction of fruits and the plasmid puzzle workshops. This may indicate that, by arranging experiment-based and hands-on activities, it is possible to attract more children into learning different facts about synthetic biology. 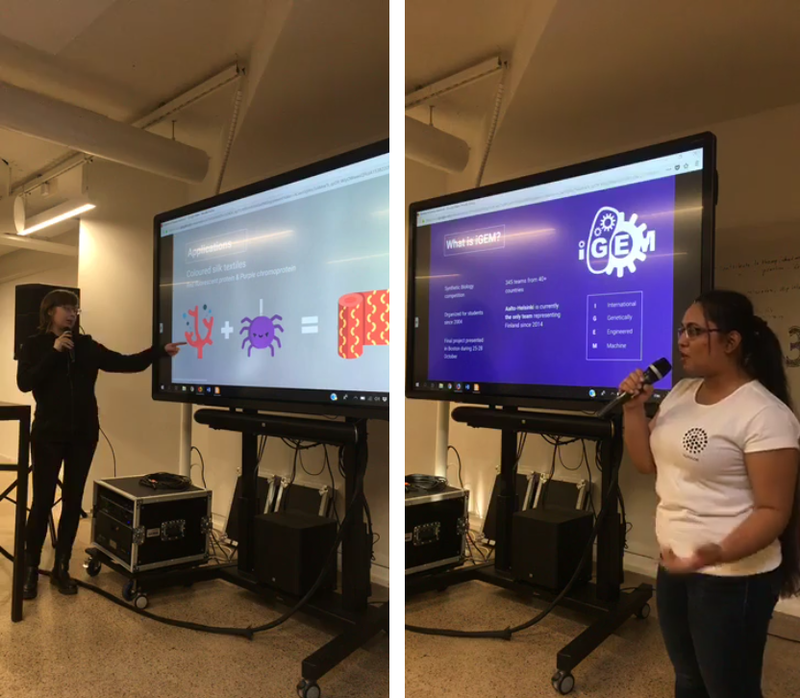 During our ideation phase, we gave a presentation about iGEM and our ideas for the project during a lecture of the “Synthetic Biology” course at Aalto University. Merja Penttilä, our secondary PI, was the responsible professor for this course, which is why we were invited to give this presentation. After presenting the most promising ideas for the project that we had come up with at that time, we had a discussion about our ideas and synthetic biology in general with the students and experts that were present. We got valuable feedback from this session and hopefully also managed to inspire some students to further develop their expertise in this area of biology. Speaking at the Synthetic Biology course. On the 9th of August, we met the Finnish high school students that will compete in the International Biology Olympiad in 2019. As a part of their preparation that included both theoretical studies and hands-on lab work, they came to meet us to hear about how university students can develop independent projects with synthetic biology. A relaxed evening with the Biology Olympiad team. In the beautiful setting of Design Factory, we first presented to them what iGEM consists of and what our project is about. As they are potential future biology students, we believed that these bright minds could be interested in taking part in iGEM in the upcoming years, so we informed them about the competition. 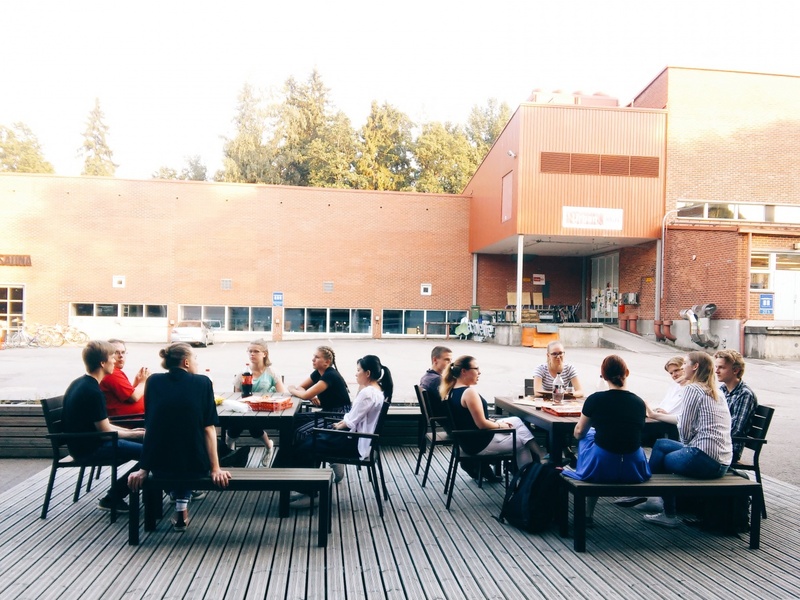 After that, we moved to a more relaxed environment – Design Factory’s sauna space, where we enjoyed snacks together and informally discussed university studies and work perspectives for biologists, as well as the International Biology Olympiad itself. In the journey of globally expanding the iGEM community, Aalto-Helsinki joined in 2014 as the first ever Finnish iGEM team. 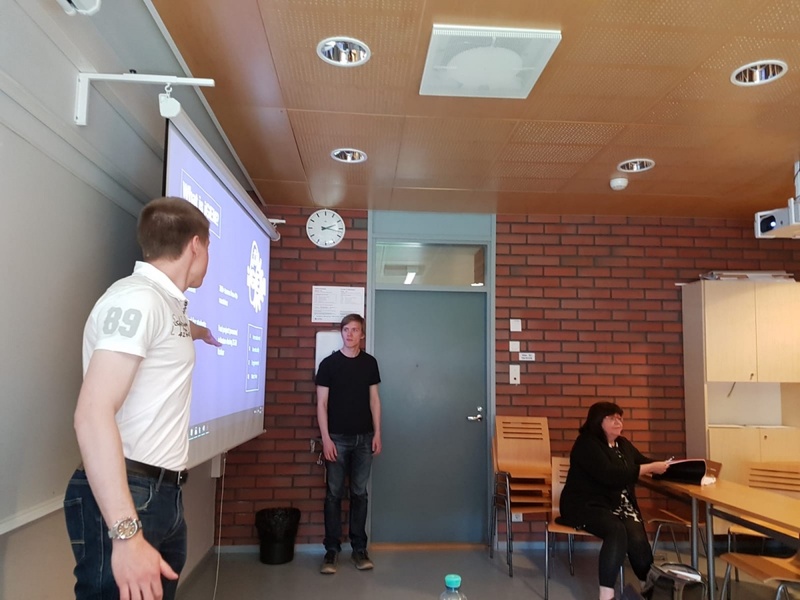 Aalto-Helsinki still remains the only team representing Finland, and hence, this year, we took one step closer to spreading the SynBio fever in other Finnish universities as well. 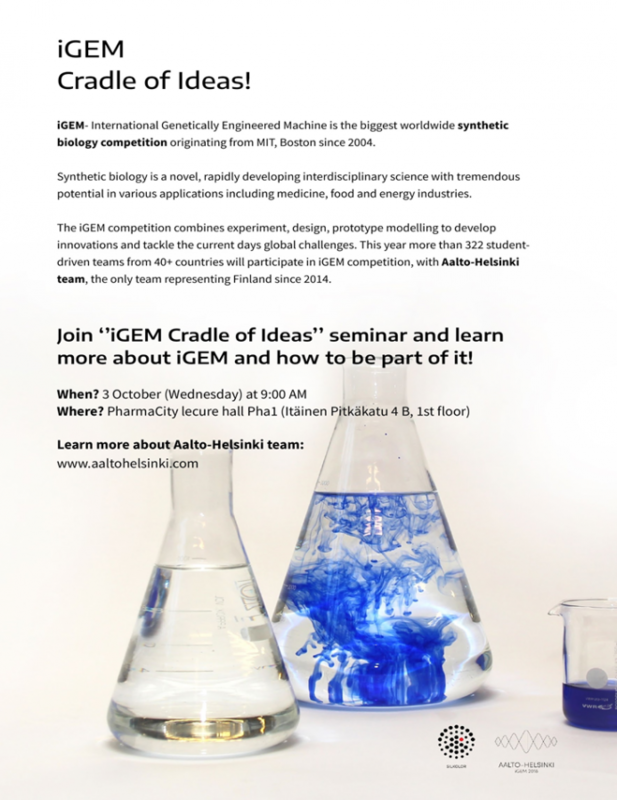 Our team attended a seminar themed ‘iGEM Cradle of Ideas’ in the University of Turku to tell more about the incredible opportunities of Synthetic Biology to solve global problems and inspire students by sharing our own experiences. iGEM Cradle of Ideas poster. We organized a seminar at The Science Basement at Helsinki Think Company. 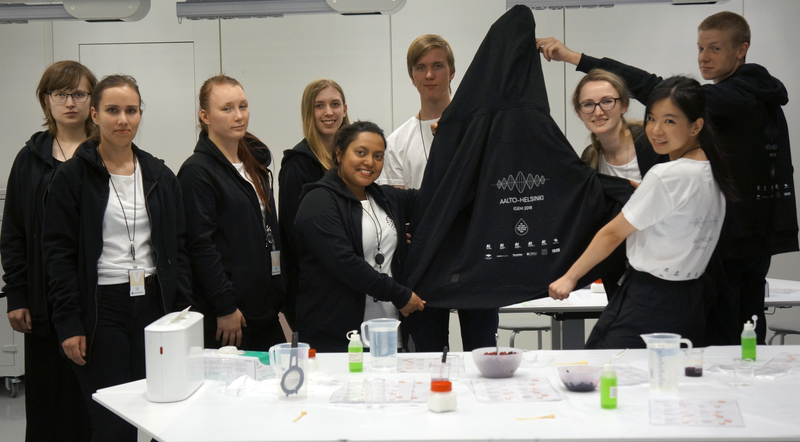 The Science Basement is a cluster of science students from the University of Helsinki and Aalto University who aim to communicate scientific topics to the general public. In our seminar, we discussed the impact of the textile dyeing industry on the environment and our team’s solution to it, as well as the meaning and significance of synthetic biology in a way that is accessible to people who don’t have a scientific background. We also introduced iGEM and the Aalto-Helsinki team. The speakers at the Science Basement. The seminar garnered a relatively small audience of about twenty people, but it was also streamed on Facebook and later uploaded there for more people to see. The topic was well-received and generated some discussion about textile dyeing and synthetic biology. We got the impression that the audience had a positive view on synthetic biology and they trusted its capability to solve major problems. 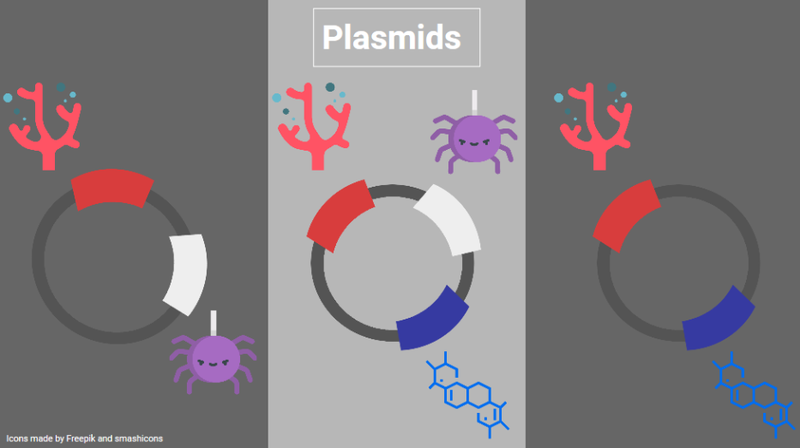 An example of our presentation slides: visualizing some of our plasmids. 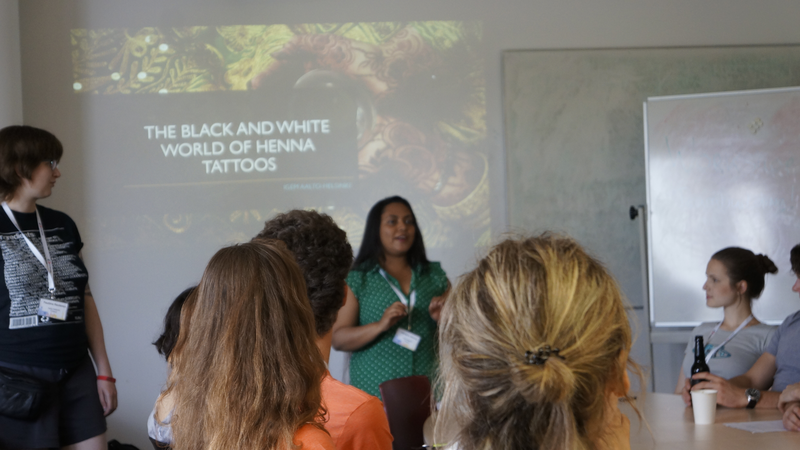 As a part of public engagement, Aalto-Helsinki team took an opportunity to host a workshop called The Black and White World of Henna Tattoos. There, our team leader Shirajum Monira has introduced the participants to the art and traditions of the henna tattoos. Coming from Bangladesh, she could share the first hand experience on how it’s being done and on what occasions it is being used. The aim of the workshop was to show the existing natural dyes of henna that are still still widely used in some cultures and to share one of the inspirations for our Silkolor product. Speaking at the henna tattoo workshop. The workshop was a success as participants were strongly engaged and interested in the topic. 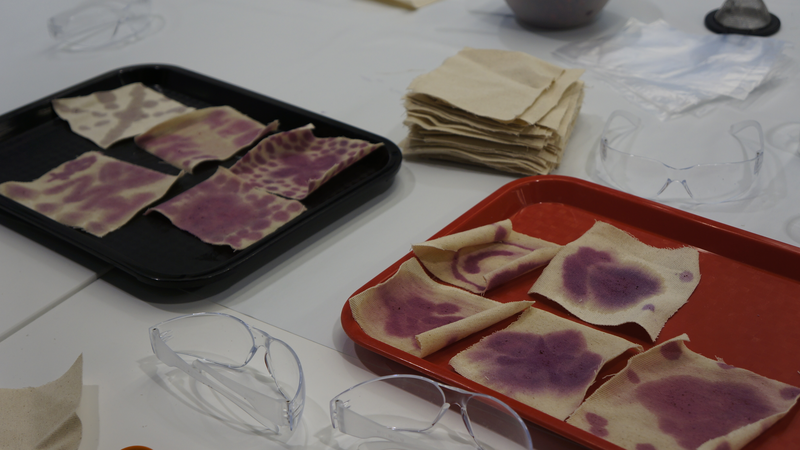 Our team received very positive feedback from the workshop participants and was happy to see them during the conference weekend having the tattoos done with natural dyes. The participants practice using henna by coloring patterns. The masters of dark arts have inherited the mysterious power of henna through the centuries-long lineage which have honed the elusive skill to perfection in the hands of their last descendant: Shirajum Monira. Sit down with her to discover the hidden meanings of ancient symbols as they are etched in to your skin. Witness the formation of primordial patterns while the henna dye is seeping inside to become one with your body. In the meanwhile, our experts enlighten you about why synthetic dyes used in textiles and hair dyeing are detrimental both to your health and the environment. Don’t hesitate to join us; we are here for you. Cold sweat was pouring on our brows, as the minutes creeped in towards the hour of our workshop. Would anyone even show up? Were we qualified to tattoo others? What if someone had an allergic reaction from henna dye? The chances of messing up this already ludicrous-sounding workshop that previously had only yielded stifled snickering from other teams were exponentially growing. But then we remembered that we are true professionals, made a couple tweaks to our prepared slides here and there and mentally steeled ourselves to ace the show. Guess what? The workshop turned out to be complete success! So, I guess the moral of this story is never be afraid of being yourself and different from others. After all, that is what makes us unique.